The Skype for Business home screen displays a lot of information in a small space. At the very top is a field where you can add a note about your day (for example, "working from home" or "in office until 3pm"). You can also put a hyperlink in this field. Others will see this message next to your entry in their contact list. If you have not entered a note, you'll see "What's happening today?" Your contacts will not see this. Next is the account you used to log in. The colored circle next to your picture (or next to the generic human icon if you aren't showing a picture) is a Presence Indicator. It indicates your status. A similar indicator appears next to each of your contacts. Your status is set automatically, based on your Outlook calendar and you current Skype for Business activity, but you can also set it manually (described below). 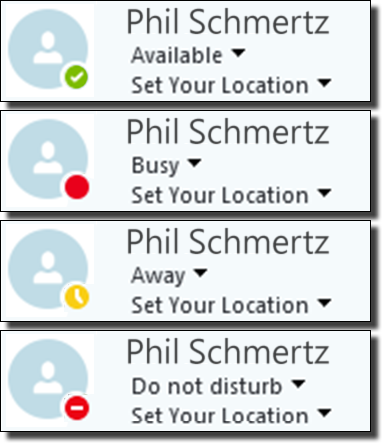 By default, only those people you have added to your Skype for Business Contacts can see your presence. See our Understanding Presence article for a complete description. Use the dropdown list just below your account name to set your status manually. Select Reset Status to return to the default state, where Skype sets your status automatically based on your calendar and Skype activity. Below that is a place to enter your location. Like your status, Skype will display your location if it knows it, based on meetings on your calendar. Click the field to enter a location manually. Skype remembers your custom locations, so you can select them from a list the next time you need one. You can also uncheck Show Others My Location if you don't want your location displayed to your contacts. The rest of the Skype for Business window depends on which view you select. The default is Contacts View, and you'll probably find this most useful. Chart comparing Zoom and Skype for Business/Lync features and recommended uses. Features and limitations when communicating with Skype Commercial (free version; also known as Skype for Consumer) or Skype Meetings contacts from a Skype for Business (Windows) account. What is Office 365 Presence? Skype lets you initiate instant messaging, a voice call, or a video call from the Contacts view. A Skype meeting is a scheduled Skype audio call (to which video can be added if desired). To join, click the link in the meeting invitation you received, open the meeting on your calendar, or join through the Skype for Business client.